legends and some interesting younger architects for a weekend of good architecture and good people all together at beautiful Awaroa Inlet, Abel Tasman National Park (via Nelson) on the south island of New Zealand. Accommodation is at Peppers Awaroa Lodge. Dates - Friday 07 October arrival and Monday 10 October departure. In 2014 we had a wonderful gathering, a celebration with a few eminent legends including ‘Ath’ at (or near) his special place at Awaroa, who was be joined by Australian legend Richard Leplastrier, plus Peter Stutchbury, Drew Heath, Kerry and Lindsay Clare and program convener Lindsay Johnston. 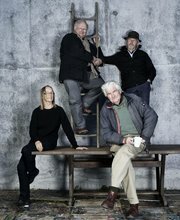 Eminent New Zealand legends David Mitchell and Julie Stout were also there, as were other eminent architects Lindley Naismith, Geoff Richards, Malcolm Walker … many others … and Julia Gatley (author of the definitive book on Athfield Architects). In 2016 we will be having another celebration with eminent legends including Australian AIA Gold Medallist Gabriel Poole (82 and still practising) and his wonderful wife Elizabeth, who are promising to give a joint presentation about their ‘long and winding road’ together. Clare Athfield and Zac are promising to do the same ‘Life with Ath’, another wonderful ‘long and winding road’. All to be celebrated. Brit Andresen has agreed to come, as she and her late husband and partner Peter O’Gorman had a holiday at Awaroa many years ago. We may have along five Australian Institute Gold Medallists - as Lindsay Clare has also agreed to come with Richard Leplastrier and, recently awarded, Peter Stutchbury.